HAND SEWN by me no machine was used. 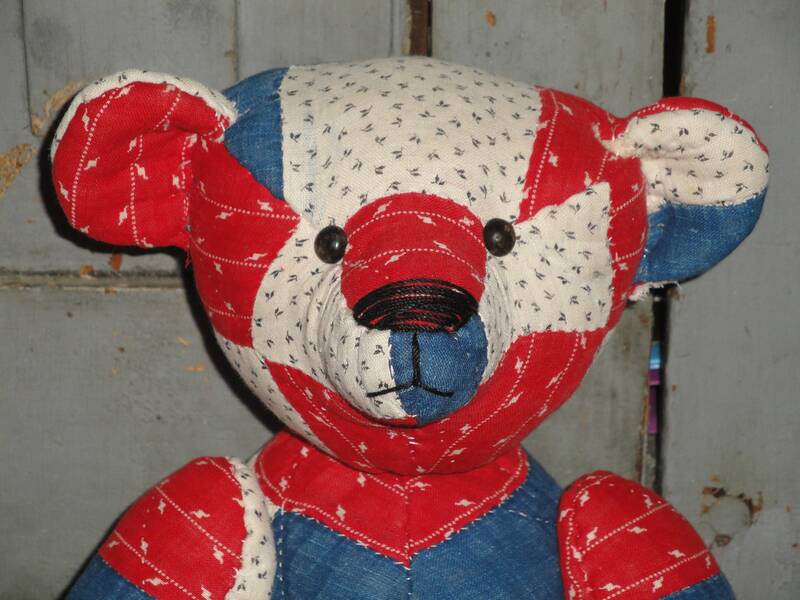 Fully jointed bear made from old/vintage quilt. Quilt was far from perfect and so is the bear. Holes, worn fabric, missing fabric, pulled threads, stains. shown stitches and more are possible. Quilt is hand pieced and hand quilted. Paws pads are also from the same old quilt just the back. Plastic joints. Stuffed nicely with poly fil. Old shoe buttons for eyes sewn in place. A hand stitched nose using black crochet cotton. Measures 15 inches tall when standing and 11 inches sitting . Plastic pellet beads added for weight. Signed. Made from a design by Trudi Williams. I just love the calico fabrics. I did not coffee this bear I left the quilt as found. NOT A TOY FOR HOME DECOR PURPOSES ONLY. Shipping/handling charges may be less depending on your location or when combining several items. I gladly refund any overages in excess of $1.00. It was exactly what I wanted. Came very fast. And was packaged well. More of the super cute vintage irons I’d previously ordered. Loved them all and my daughter loved them too so she asked me to order a few more for her area of the sewing room. She’s going to be so excited to see these. Thank you! Nice heavier material! Good for cutting my own rug binding! I have no way of knowing where my items are going and how many are going. If I over charge for shipping/handling or if you combine items and shipping/handling charges are less I will gladly refund any overage more than $1.00 If you would like a exact shipping quote convo me and I'd be glad to get you one. When shipping in the US I do my best to get you the best shipping costs on your order. I ship mainly USPS but will use UPS for larger items. I ship several times a week. Computer monitors can vary in color so if you have any questions or concerns about fabric color or size of fabric print please convo me before you purchase. Homespun fabrics typically have some slubs and irregularities in the weave which are characteristic of this type of fabric and should not be considered flaws. Homespun fabric is not meant to look perfect. Fabric patterns are woven not printed on the fabric hence pattern is the same on both sides and shows the woof and warp or grain of the fabrics. Some irregularities are expected which give homespun fabrics their primitive charm. All fabric is cut straight from the bolt according to the way the fabric is folded on the bolt from my supplier which is not always symmetrical to the design. I recommend ordering slightly more than your project needs to allow for this when using fabric with directional designs. All old quilt items are far from perfect. Holes, stains, spots, missing threads, dry fabric, fraying and more are all possible. International customers are responsible for all dues, fees or charges for their package entering their country. COLORADO RESIDENTS I WILL BE COLLECTING 4.63% SALES TAX FROM YOU. Do I Combine Shipping Charges ? Yes and I refund any overage in excess of $1.00. Who pays import fees ? Customer pays all import fees. No import fees are collected by me. Do I send samples ? Yes I send up to 4 free samples. Please convo with mailing address and sample(s) needed.